I have to admit that this word has always intimidated me. I spent many years feeling inadequate and unworthy to come before God with my petitions; fumbling through the right words, careful to try and say just the right thing; for some reason thinking I had to silently pray in the "King James Version". It was a struggle, so I would find myself there only as a last resort. I spent years thinking that prayer was just a way to ask God for what I wanted, never understanding that prayer served a much greater purpose. Never really grasping that God loves me and wants to have a relationship with me! Of course, to build a relationship takes spending time with each other and takes communication. Prayer. Prayer warrior or prayer wimp? Hello, I'm Jana, and I'm a prayer wimp. "Hello, my name is Max. I'm a recovering prayer wimp. I doze off when I pray. My thoughts zig, then zag, then zig again. Distractions swarm like gnats on a summer night. If attention deficit disorder applies to prayer, I am afflicted. When I pray, I think of a thousand things I need to do. I forget the one thing I set out to do. Pray." And I must admit that it is a bit comforting to know that a pastor and man of God such as Max struggles with prayer also. There is hope for me! And friend if you're saying, "yea, that sounds like me too", then know that here is hope for you too! He also goes on to tell us that, "prayer is simply a heartfelt conversation between God and His child." A conversation... personal, confidential, mutual. This helps me, just be me, just talk to God. And this has made a difference for me with my prayers. Oh I still have struggles, I am not where I want to be and not where I need to be with my prayer life. But with the help of God, I am not where I used to be. Progress. 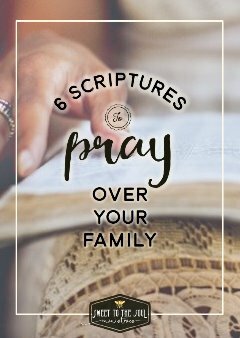 ​One day while talking with a friend about prayer, she mentioned to me that as part of her daily prayers she prays scripture over her family and friends. If they were in a particular battle or dealing with a specific struggle, she would ask God to show her an applicable scripture to pray over her loved one. I loved this idea so I did the same for my family and below are some of the scriptures I try to pray regularly over my family. Soul Friends, I would love to hear from you about your prayer time. Do you set aside a specific time of day for prayer? Do you have a special place you go to meet with God to pray? Do you use a journal? Join the conversation below and let's inspire and encourage each other on our prayer journeys. If you enjoy praying for others or feel in need of a prayer community to pray for you, we would love for you to join our fb prayer group "Prayer Closet". Soul Friends is a group of Christ loving women who want to share their #graciouswords and stories of God’s greatness and blessings in their lives with others. So join us here, and make not just new friends, but #SoulFriends. Thank you Kim. Talking to God all throughout the day is wonderful! I loved how you simply stated you aren't where you want to be but with His help, you aren't where you used to be. I'm right there growing too. I am also a big fan of praying scripture over loved ones and family--and I love the ones you have been lead to pray. Thanks Deborah! And thanks for joining the #SoulFriends linkup today! Blessings! Wow... great post here! Loved the way you use scripture as a foundation for your prayers. Thanks for sharing and encouraging me. Thanks for hosting this link up. This is first time here, now I'm following you. Jana, way back in 2008 is when I began my morning meetings with the Lord. I had committed to pray for my enemy. And the Lord took me up on my offer! He was faithful to wake me each morning (I am NOT a morning person). Even so, I still find that I am a prayer wimp! Thanks for this encouraging post! Oh Ellen thank you for this. You touch on such an important area of prayer - praying for our enemy. I spent some time doing that and thru it, God was able to soften my heart toward forgiveness. Jana, thanks so much for this reminder of praying scripture over our loved ones ! And for the beautiful scripture prayers! I pray daily for my family. I have specific scriptures I pray daily for them along with whatever needs they have. I have been keeping my prayer journal on Evernote. It's free up to a certain monthly usage amount (that I have never reached yet) and I can tag each family member that I pray for and I can search prayers by date, etc. The prayers you listed above are all one I have or continue to pray over my family. I love praying Phillipians 1:8-10 - "I pray our love abounds more and more to its fullest development..." and I pray 2 Tim 1:7 daily thanking Him that "my family has a spirit of power, love and a sound, well balanced mind" and so many others. I would hate to think how my household would be right now if I didn't pray and where my kids would be and my marriage probably over. God is soooo good and He desires us to pray in line with His will. What better way to pray than with the scriptures He gave us? Thank you for your faithfulness and continued inspiration!